Pennsylvania Cherry Two Piece Corner Cupboard; Pennsylvania Cherry Two Piece Corner Cupboard Pennsylvania Cherry Two piece Corner Cupboard Upper section with stepped Crown molding and molded mullion 12 light ..
Small Boston Rocker; Small lady's Windsor rocker in original grain painted decoration. 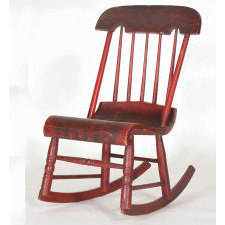 The grain painting on this American Boston rocker is in wonderful condition. 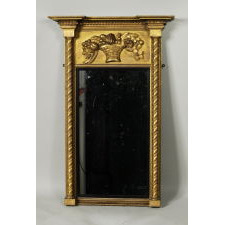 Red and black grain paint lookin..
Rare OVERMANTEL MIRROR; Beautifully carved and gessoed, with classic Egyptian pilasters, and traditional carving throughout. Excellent proportions , and detail. Glass is an old replacemen..
Small Signed Table; Small end table with slender turned legs on original porcelain casters. Signed simply Edwards & Roberts. Circa 1845 to 1899. Width is 30.5 with the leaves up. This cabinet..
"Heart" Stool; A polychrome-decorated pine stool embellished with 44 red and blue carved hearts. An old label affixed to the underside indicates that it is one of seven "heart" objects made ..
Mahantongo Decorated Four-Drawer Chest; Decorated Four-Drawer Chest Attributed to Johannes Mayer (1794-1883) with painted decoration attributed to Reverend Isaac Stiehly (1800-1869) Mahantongo Valley, Northumberland..
19th Century Regency Rosewood and Calamander Games Table Circa 1815; Of British manufacture, this circa 1815 gilt metal mounted veneered rosewood and calamander grained games table, has an inlaid sliding reversible top, which reveals a tooled g.. 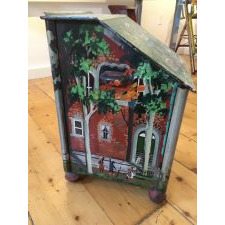 Painted Coal Hod; Nancy Whorf (Provincetown, 1930-2009) painted coal hop depicting fire station, Pumper No. 1. Country Store Two-Part Nesting Shelves; This uniquely constructed set of shelves was formerly a prop used by Pat Guthman at many shows to display her wonderful kitchen and fireplace related pieces. Perhaps yo.. Very Fine Classical Carved Mahogany Sideboard; New York 1810-1820 The splash back with a broken arch pediment with flanking carved pineapple finials above an oblong mahogany top with canted front corners and b..
"Center Table with Marble Top" Attributed to Pottier and Stymus, New York; Ca. 1870.Rosewood, marquetry of various woods; Secondary woods: tulip poplar, oak or ash, gilding, gilt brass, bronze. 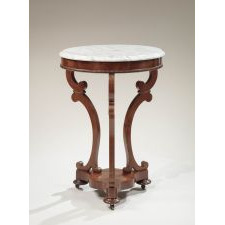 Top: Marble.Customer name "Buell" followed by 36373 mark..
"Queen Anne Tray Top Tea Table"; English, ca. 1750.Mahogany, oak and pine secondary woodsHaving a tray top with notched corners above a small drawer inset into a skirt with carved "cupid's bows" supported by ..
"Rare Early Hudson Valley Armchair"; Probably New York, ca. 1720-1750.Maple, Ash, rush seatExcellent condition, full height, wonderful patina.The rush seat is at least 100 years old and the finish is at least 150..
"Rare Federal One Drawer Side or Serving Table"; New England, ca. 1800-1820. Tiger maple, poplar and pine secondary. 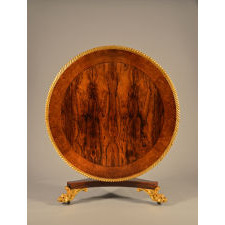 The rare form is complimented with the use of bold tiger maple. Having a slightly over-hung top above a dra..
"Queen Anne Day Bed"; Pennsylvania, ca. 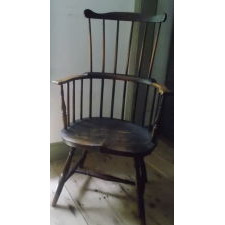 1740-1750.Maple, rush seat.Condition: Excellent condition, retaining all the original feet. 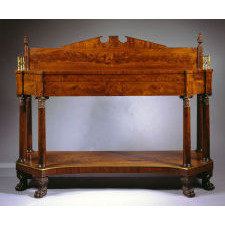 Re-rushed.This rare example of a Queen Anne Day Bed is complete h..
"Rare Queen Anne Tavern Table"; Probably Philadelphia, Pennsylvania.ca. 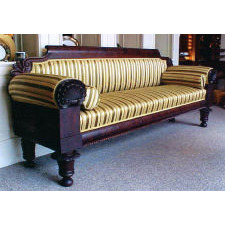 1730-1750.Yellow pine, soft maple.Having a thumb-molded, one board top above a rectangle frame with beaded-edge nails supported by bloc..
"The Butler Family Chippendale Armchair"; Mid-Atlantic Region, possibly VirginiaMahogany, original slip seatCondition: Untouched original condition, minor abrasions on front legs. 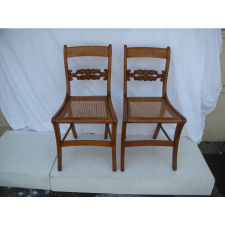 Early, if not original, varnish finis..
Set of Classical Tiger Maple Chairs; Set of Classical Tiger Maple Chairs Set of 6 Tiger Maple Chairs. Rolled and shaped crest over Lyre medial splat, above a cane seat. 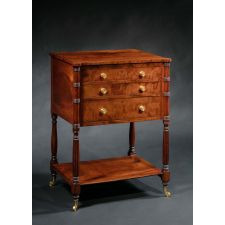 Ending on Classical legs supported by turne..
American Tiger Maple Stand; American Sheraton Tiger Maple One Drawer Stand. Rectangular top over Chamford edge dovetailed drawer. Ending on Ring turned legs with surpressed ball and peg foot. 19 1/2" x 1..
AMERICAN TIGER MAPLE STEP BACK CUPBOARD; American Federal Tiger Maple and Mahogany Two piece Step Back Cupboard. Upper section with high unusual cove crown molding over Two glass doors with molded mullions opening to..
Shaker Ladder-Back Side Chair; Having distinctive finials attributing the chair to the Shaker community at Canterbury, NH. 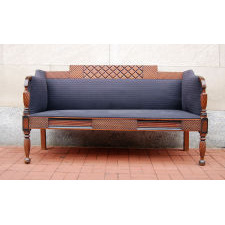 With three arched, beveled, graduated slats, attenuated posts and retaining an old .. Important Shaker Desk on Frame; A rare and probably unique example of utilitarian Shaker design in an absolutely undisturbed condition being offered for the first time. 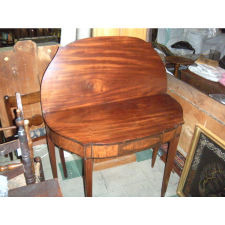 Having a dovetailed case desk wi..
Shaker Work Table with Drawer; A very elegant table of moderate size having a two board birch top with mortise and tenon breadboard ends above a rectangular frame fitted with a dovetailed drawer having a mo..
Carved Chippendale Lowboy; Connecticut, probably Fairfield County, possibly Stratford.Ca. 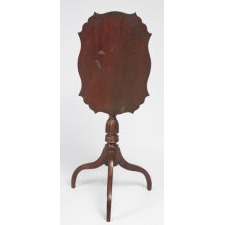 1760-1770.Cherry, poplar secondary wood.This rare form with carved C-scroll legs and well-executed carved ball a..
Chippendale Blocked-Front Secretary; Connecticut River Valley, Possibly Northampton-Springfield Area.Ca. 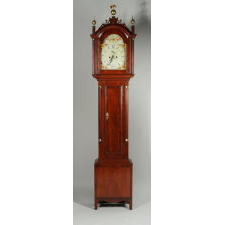 1760-1775.Cherry, white pine secondary wood.Condition: Fine condition, retaining the original flame finials.. The Wendell Family Chippendale Blocked-Front Chest; New England, probably Coastal Massachusetts, ca. 1760-1775.Mahogany, white pine secondary wood.Condition: Fine condition, retaining the original cast brass pulls, very minor s..
Niels Erik Glasdam Jensen Danish, active mid-20th c.; Mid-Century Danish Bar CartStamped underneath: "Vantige Møbelindustri, 11-10-68, Made in Denmark"Danish designer Niels Erik Glasdam Jensen, the founder of Vantige M&osl..
Queen Anne table with shaped top and old surface; Nice Queen Anne table with original shaped and molde top and old surface of blue-gray over original red, c. 1760. 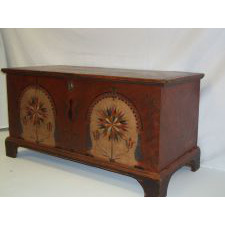 Probably Rhode Island or South Eastern Massachusetts o..
Rare and Unusual Paint-Decorated Blanket Chest; New England, ca. 1820-1830.White pineHaving a thumb-molded top opening to a well interior with a till, the conforming casewith an applied base molding is supported by shaped b..
Federal Cardtable; North Shore, Massachusetts or Coastal New HampshireCa. 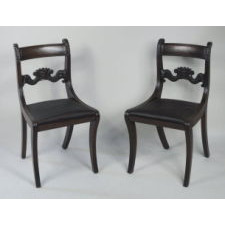 1800-1850.Mahogany, flame birch veneer; secondary wood, pine.Condition: Overall fine condition with minor imperfections,..
Set of 12 Mahogany Dining Chairs; FINE AND RARE SET OF TWELVE CLASSICAL MAHOGANY DINING CHAIRS Comprising 11 Side Chairs and an Arm Chair Philadelphia c.1830 The slightly curved tablet crest rail .. 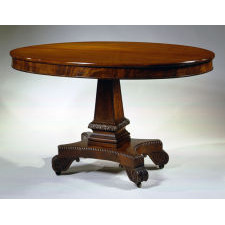 Oval Carved Mahogany Center Table; EXTREMELY FINE AND RARE CARVED MAHOGANY OVAL CENTER TABLE Boston, c. 1820 The fixed oval top with a shallow skirt above a central, paneled pylon-shaped standard with an.. 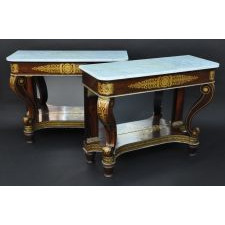 Pair of Brass-Inlaid Carved Mahogany Games Tables; FINE PAIR OF CLASSICAL BRASS INLAID CARVED MAHOGANY GAMES TABLES Philadelphia, c.1815 Each with hinged and swiveling, radial, elliptic tops with brass string inlay on t..
Carved Mahogany Grecian Sofa; CARVED MAHOGANY GRECIAN SOFA Boston, c. 1830 Each with a highly figured, shaped crest with carved volutes above an upholstered back and anthemion-carved broken scroll a..
Federal Carved and Gilded Overmantle Mirror; Very fine federal carved and gilded three part overmantle mirror, having an architectural cornice top above a three part frieze with eglomise panels, flanked by fluted and eng..
Hepplewhite Bow Front Mahogany Serving Cabinet; Very rare hepplewhite bow front mahogany serving cabinet, with bow front line inlaid top above two conforming long drawers and two serpentine recessed cabinet doors, raised on..
Hepplewhite Inlaid and Parcel Gilt Mahogany Mirror; Very rare hepplewhite inlaid and parcel gilt mahogany mirror, with arched swanneck top with gilded applied moldings with carved floral rosettes, centering an elaborate carved ..
Hepplewhite Mahogany Secretary Desk; Very fine hepplewhite figured mahogany secretary desk, in two parts, the upper section with arcaded shaped cornice above two diamond mullioned glass doors, in turn above two f..
Hepplewhite Mahogany Swell Front Chest; Fine hepplewhite inlaid mahogany swell front chest, with solid mahogany top with crossbanded edge, above four graduated beaded drawers with string inlaid border and richly fig..
Hepplewhite Rectangular Overmantle Mirror; Very fine and rare hepplewhite carved and gilded rectangular overmantle mirror, with urn and spray central ornament, swag and drapery detail with festoons and paterae, ending ..
Hepplewhite Small Inlaid Serving Table; Rare small hepplewhite inlaid cherrywood bow front serving table, with fanciful inlaid top with rectangle with curved ebony teardrops, above a conforming case with one long dr..
Hepplewhite Tambour Ladies Writing Desk; Fine hepplewhite inlaid mahogany two part tambour ladies writing desk, the upper cabinet with inlaid central door with concealed drawers, flanked by tambour sections with cubb..
Hepplewhite Transitional Dining Chairs, Set of 12; Exceptionally fine and rare set of 12 Hepplewhite transitional mahogany dining chairs, with arched crest rail and flaring stiles, with pierced cutout splat in prince of wales ..
Irish Queen Anne Tea Table; Very fine queen anne carved walnut tray top tea table, rectangular with carved cabriole legs ending in carved and lobed trifid feet. England or Ireland, circa 1740-60. 28" hig.. Pair Carved and Brass Inlaid Mahogany Side Chairs; Fine pair of carved and brass inlaid mahogany side chairs, with curved and rolled crest rails with brass string inlay, set on stiles centering a carved horizontal splat with c..
Rare Sheraton Mahogany Lolling Chair; Exceptionally fine and rare sheraton carved mahogany lolling chair, with arched crest and upholstered back, with shaped and elaborately scrolling arms, the upholstered seat se..
Sheraton Carved and Inlaid Figured Mahogany Game Table; Very fine sheraton carved and inlaid figured mahogany game table, with serpentine top with rich figured mahogany, the edge with string inlays and rosewood crossbanding, above ..
Sheraton Architectural Mirror; Fine sheraton carved and gilded architectural mirror, with cove molded cornice above a carved inset tablet of fruit, flanked by ebonized and gilded twisted columns centering a..
Carved Miniature Furniture; A 5 piece suite of miniature furniture signed by maker, "Bilikel 60 Nicoll St., New Haven Conn". 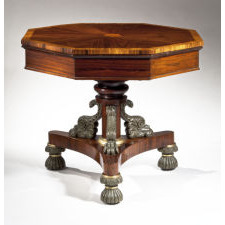 Each piece is unique, the table (14" high, 12" across) has a turtle as the bas..
Armchair, School of Eliphalet Chapin; Cherry, rushCirca 1785Possibly East Windsor, CTH: 42"; W: 25.75"; D: 24.5" There are a number of decorative and construction features on this side chair that strongly s..
Drop Front Desk, Maine Circa 1830; Assorted hardwoods with original red paintCirca 1830H: 44"; W: 40"; D: 19" A drop front desk over four drawers with a wonderful dry original painted surface. 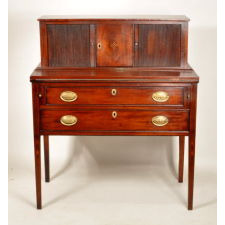 The desk r..
Miniature Chest of Drawers, Pennsylvania dated 1829; A miniature Chippendale chest chest of drawers in a three over two over three configuration with bold ogee bracket feet, scratch beaded drawer fronts and reeded corner columns..
Ware Ladderback Rocking Chair ; American, made in Roadstown, New Jersey, probably late 19th –early 20th century. 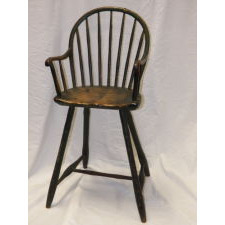 An excellent example of a Roadstown, New Jersey turned, slat back, rush seat Ware chair .. The Art of the Picture Frame: Artists, Patrons and the Framing of Portraits in Britain; The Art of the Picture Frame: Artists, Patrons and the Framing of Portraits in Britain by Jacob Simon. 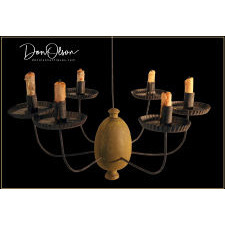 Published by the National Portrait Gallery in London, England, in 1997 i..
Scandinavian Painted Decor; Scandinavian Painted Decor by Jocasta Innes was published in 1990 to highlight the interior design and woodwork painting techniques that make Scandinavian interiors unique. Th..
Fine Carved Mahogany Grecian Sofa; Possibly Kimball & Sargent Probably Salem, Massachusetts 1830-1835 The molded crest rail centering a carved anthemion with arms carved with acanthus leaves, l..
Shaker Rocking Side Chair; A #3 taped back example, produced in the Mount Lebanon Shaker chair shop during the fourth quarter of the 19th Century. All original including the original royal blue an..
Shaker Rocking Armchair; A classic example of the Rocking Armchairs made by and for the Elders of the New Lebanon, New York Shakers. Constructed of curly maple and maple, retaining a fine old as..
Shaker Pantry Cupboard; Pine retaining an old or original brown painted surface. 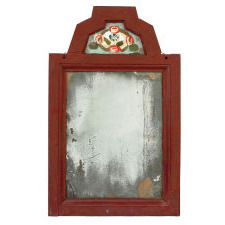 Inscribed on the interior; “Barrel of flour got the 18th of June-my first week in the kitchen” Shipping la..
Panel Door; Ohio, ca. 1820. Superb raised panel door retaining most of its original paint, original iron hinges and latch. 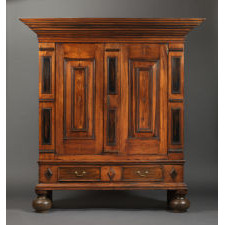 Exceptional Carved Stepback Cuboard; Exceptional stepback cupboard with carved freize and stop fluted columns. Three paneled drawers with the middle one being a smaller candle drawer. 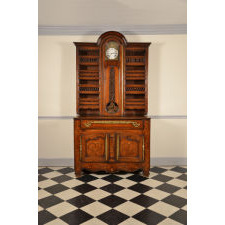 Two paneled doors and a brac.. 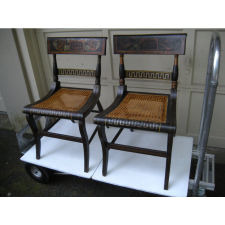 Excellent Pair of Chairs; Excellent pair of William IV rosewood & gilt hall chairs with lyre form backrests with superb carving and detail. 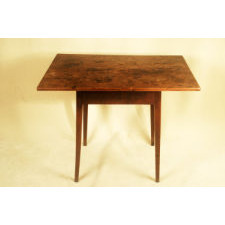 Chippendale Triple Top Games Table; Very rare Gothic Chippendale triple top games table in remarkable original condition. (note the small size) What an amazing survivor! 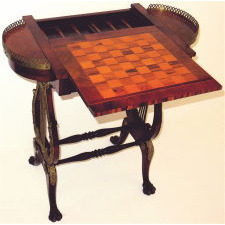 Even the original backgammon..
An American Mahogany �tag�re; Mid-Atlantic, Circa 1850. 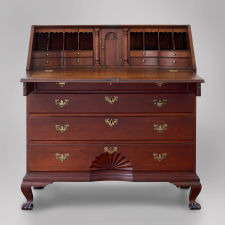 The mahogany étagère has five stacked shelves supported on turned columns with X-shaped supports at each end above a bottom shel..
New England Writing Desk / Server, circa 1835; Fine writing desk with notable detail, including cut scrolls on the backsplash and both sides, inlaid knobs on the lower drawer, five dovetailed drawers on two tiers, nicely t..
Southern Rocker, Original Paint Decoration and Seat, circa 1830 ; Small painted rocking chair attributed to a documented Wilmington, North Carolina chairmaker, circa 1830. 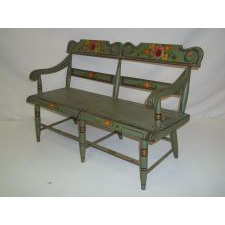 Excellent original paint and rush seat, bamboo turned frame. Few othe..
American Kasten: The Dutch-Style Cupboards of New York and New Jersey, 1650-1800; American Kasten: The Dutch-Style Cupboards of New York and New Jersey, 1650-1800 was written by Peter Kenney and published by The Metropolitan Museum of Art in 1991 in conjunc.. Girl Scouts Loan Exhibition Catalogue 1929; This is an excellent 1977 published reprint of the original 1929 exhibition catalogue. 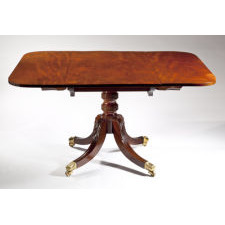 The complete title is Loan Exhibition of Eighteenth and Nineteenth Century Furniture &am..
Queen Anne Drop Leaf Dining Table; Queen Anne Drop-Leaf Table, Massachusetts, ca. 1775-1795. Walnut. 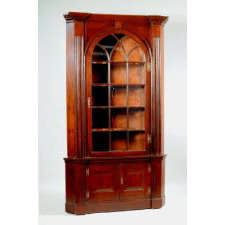 A great example of a Massachusetts drop leaf exhibiting all the features we like to see: a well proportioned-..
Fine Late Federal Mahogany Secretary Bookcase; Comprised of two parts: The projecting pediment top above a veneered frieze above a pair of glazed cabinet doors with Gothic tracery opening to four fully adjustable shelves, ..
Carved and Stenciled Mahogany Center Table; CENTER TABLE WITH INSET MARBLE TOP The circular top with dark figured marble inset held by a wood frame, above a conforming apron with three large foliate gilt-stencils.. VERY FINE CARVED MAHOGANY GRECIAN SOFA; In the manner of Duncan Phyfe (1770-1854) The scrolled crest rail with a central panel with relief-carved intertwined cornucopia issuing fruit and wheat, flanked ..
Rare Raised Panel Two Door Painted Cupboard; Probably Canadian, early 19th c. Pine, original light olive green painted surface. 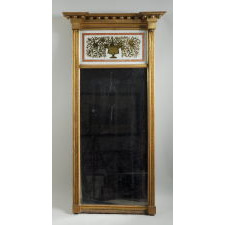 This well proportioned cupboard with eight rasied panels is fitted with the original shelvin..
Octagonal Rosewood Library Table; Attributed to Cook & Parkin (active 1819-1833) Philadelphia, c. 1827 The octagonal radial top with spalted satinwood cross-banding and central medallion above a ebo..
Carved Mahogany Mechanical Arm Chair; Possibly by Cook & Parkin (active1819-1833) The lotus-carved arched crest rail above a beaded frame holding an upholstered back, hinged at the base, allowing the ba.. 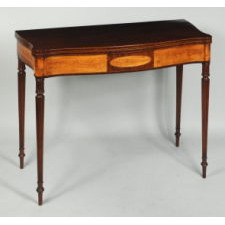 UNUSUAL FEDERAL MAHOGANY SINGLE DRAWER WORK TABLE NEW YORK STATE CIRCA 1810; Having never before seen a work table of this width, I have to conclude that it was a custom made piece. 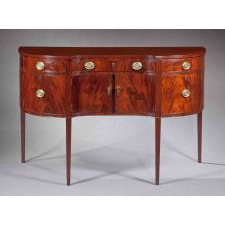 The choice mahogany veneers and nicely turned legs indicate a ca.. PAIR OF PHILADELPHIA MAHOGANY HEPPLEWHITE VASE BACK SIDE CHAIRS CIRCA 1795; These chairs are identical to the side chair in the Winterthur collection pictured in "American Furniture, The Federal Period" by Montgomery on page 135 and #86 on page 139.&n..
European andirons; A very fine pair of European andirons in an unusually large size. Beautifully detailed -and with stepped-up feet. Dutch or French, c.1700-1720. 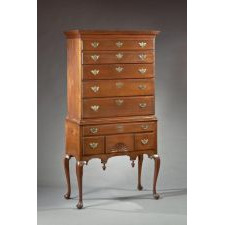 24" ht, 24" d..
Chippendale Tall Chest; A Chippendale tall chest with 'tray' top, triple top drawer-the center one with a fan, six rows of drawers all on a tall brack..
Country Queen Anne Chest with Drawers; A very unusual, perhaps unique, small country chest with fan-carved center drawer, fluted half columns, and full bracket base. 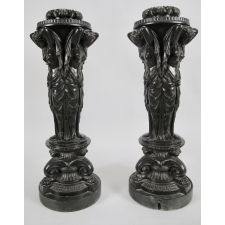 Made of cherry, in old brown paint over an..
Federal andirons; A fine pair of 'double lemon-topped' andirons, left and rights, with rare pierced fenceing. New York origin, c.1810. In exceptional condition. 23 1/2" ht, 27" deep. 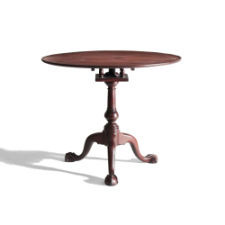 Newport, RI Table; A rare and fine Newport, RI tea, or breakfast table with a molded and dished top, urn-shaped post, and with cabriole legs ending in short pad feet. 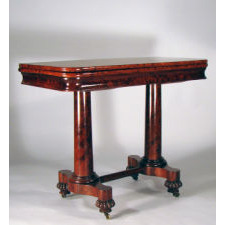 Mahogany, with birch ..
Chippendale Pembroke table ; A very fine Chippendale Pembroke table with square, shaped cornered top, drawer, pierced corner brackets, and fully-molded legs. Walnut, with pine, poplar, and maple sec..
Bannister-backed armchair; A fine and rare maple and ash bannister-backed armchair in original structural condition and retaining an old red-stained surface. 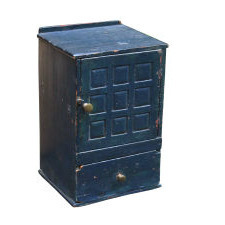 The shape of the finials, slight bow t..
Paneled chest; A small stile and panel chest-with molded stiles- in old worn blue paint. Great surface quality- and only 37" long, 19" deep, and 21" in height. England, c.1660-80..
Pilgrim Century chest over drawer; A rare Pilgrim Century chest over drawer: the three panels on the front with applied molded edges, and the ends with a large, square raised panel. 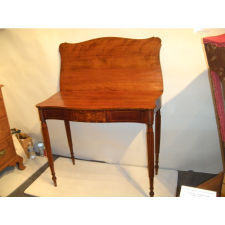 The front stiles termi..
Queen Anne desk on frame; A rare and fine, possibly unique, Queen Anne desk on frame. 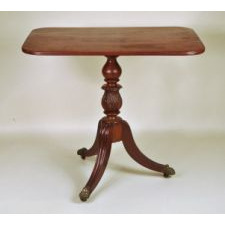 Made of cherry throughout, in old red paint, this desk was bought privately in a house in Exeter, NH, but is ..
Queen Anne drop leaf table ; A fine country Queen Anne drop leaf table with oval top, applied shaped skirt, and with oversized feet. 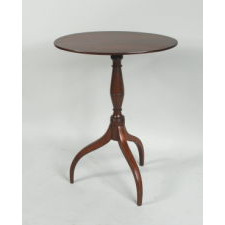 Maple, with pine and oak secondary woods, in an old finish with s..
Queen Anne stand; A wonderfully folky Queen Anne stand with chamfered round top and truncated cabriole legs. 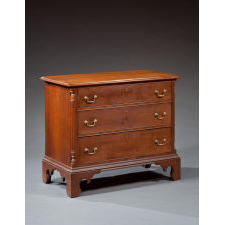 Cherry throughout, in original brown paint-worn to almost a scrubbed finish on..
Queen Anne two drawer blanket chest; A fine country Queen Anne two drawer blanket chest with three false drawers-all outlined with double-arch molding. 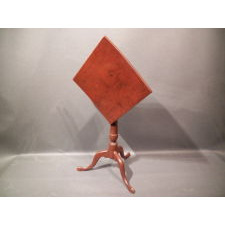 Poplar, in original red paint under a thin coat of old..
Peter H. Eaton Antiques, Inc.; Established in 1970. 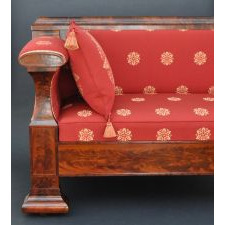 Specializing in New England furniture made before 1810, primarily in original, unrestored condition. A particular emphasis on furniture made between 1690 ..
High Chair; Childs bowback 7 spindle high chair, bamboo turnings good D shape seat. 2nd 19th century green paint. Book Case Desk; Chippendale blocked reverse serpentine desk bookcase. Two part, the top with raised panel doors, bold cove dential molding cornice, quarter columns matching the skirt below fo.. 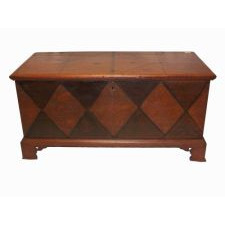 Blanket Chest; Paint decorated blanket chest with interesting graphic diamond pattern design. Bench Table; Original blue three board top bench table. Good condition, two spots filled in on the top. Unique Folk Art Sideboard; Two part carved and painted, various animal scenes and graphic designs including homestead painting inside drawer. 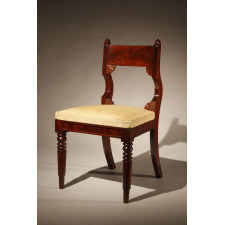 Comb-back Windsor Side Chair; A relatively common bowback Windsor side chair is made extraordinary by the addition of a crest and the original green-painted finish accented with yellow striping and foliate..
Sheraton Mahogany Game Table; Very fine sheraton carved and inlaid figured mahogany game table, with serpentine top with rich figured mahogany, the edge with string inlays and rosewood crossbanding, above ..
Sheraton Inlaid Mahogany Serving Table; Exceedingly rare sheraton carved and inlaid mahogany serving table, with figured mahogany top with crossbanded border above a quadruple reeded edge, above a conforming case wi..
Sheraton Carved Mahogany Sofa; Fine sheraton carved mahogany sofa, with three panel crest having a central bow knot carved panel, with reeded sloping arms above turned, reeded and acanthus carved arm posts,..
Sheraton Four Post Bed; Exceptionally fine sheraton carved birch four post tester bed, with delicate turned and reeded footposts with reeded urn, square rail block and attenuated turned legs with tur.. 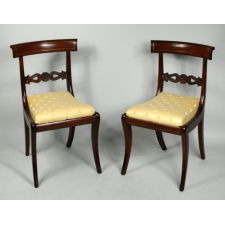 Pair Classical Carved Mahogany Side Chairs; Fine matched pair of classical carved mahogany side chairs, with paneled shaped crest centered between shaped stiles with acanthus carved tops, above a cornucopia carved horiz..
Hepplewhite Mahogany Tip Top Candlestand; Very fine hepplewhite inlaid mahogany tip top candlestand, with oval top set on a bublous turned shaft raised on delicate arched spider legs with string inlays and inlaid geom..
Hepplewhite Mahogany Shield Back Side Chair; Very fine and rare hepplewhite carved mahogany shield back side chair, the back with cove molded and beaded surround, with three intersecting vertical slats with leaf carving,..
Hepplewhite Mahogany Mirror; Very rare hepplewhite inlaid and parcel gilt mahogany mirror, with arched swanneck top with gilded applied moldings with carved floral rosettes, centering an elaborate carved ..
Federal Transitional Mahogany Swell Front Chest; Exceptionally fine and rare federal transitional carved and inlaid mahogany swell front chest, with solid figured top with string and crotch mahogany inlaid edge, above four c..
Federal Mahogany Tip Top Table; Very fine federal figured mahogany tip top table, with octagonal top with ebony stringing and broad crossbanded edge, set on an urn form column raised on molded sabre legs end..
Federal Corner Cupboard; Fine federal stained pine two part corner cabinet, with large cove molded top with chamfered corners, above a tombstone arch with arched mullioned door with glass panes, flank..
Federal Cherry and Mahogany Tall Case Clock; Fine federal inlaid cherry and mahogany tall case clock, the hood with pierced fretwork and fluted plinths, above a tombstone aperture with crossbanded door, the case with mol..
Federal Carved and Gilded Mirror; Very fine federal carved and gilded architectural looking glass, with cove molded top and carved twist molded stiles, with classical eglomise panel above a rectangular plate, ..
Chippendale Cherrywood Chest; Very fine chippendale cherrywood chest, with an undermolded top above four graduated drawers within cockbeaded case, flanked by engaged fluted quarter columns, set on ogee bra..
Federal Carved Mahogany Tea Table; Very fine late federal carved mahogany tip top tea table, with rectangular top with molded edge, tipping on a turned and foliate urn form acanthus carved column with star punc..
CARVED, GILDED, FAUX-ROSEWOOD-GRAIN PAINTED AND ROSEWOOD PEDESTAL DESK; Condition: Excellent: having an old repair to a break in one leg. 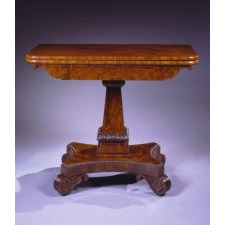 The lids to the writing compartments and pen rest are replacements as is the leather writing surface.&n..
Carved Mahogany Drop-Leaf Dining Table; Rare Single-pedestal Dining Table that Seats Six. VERY RARE AND FINE CLASSICAL CARVED MAHOGANY CABINET-FORM ; The flat oblong pediment top over a tall case having a pair of paneled cabinet doors with glazed arched and Gothic tracery windows in the top half flanked by pilasters with ac..
English Mahogany Bachelors Chest; Superb George III mahogany serpentine bachelor's chest of drawers with conforming molded top edge with notched corners in front. There is a dressing slide over very bold gradu.. 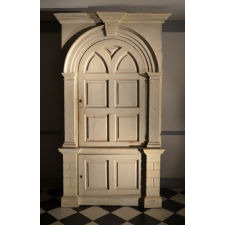 Corner Cupboard; Superb barrel back corner cupboard with arch paneled door flanked by pilasters supporting a keyed arch (the key extends into the cornice). 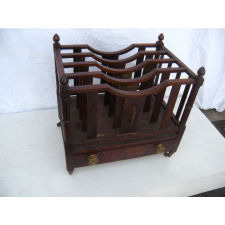 The pilasters rest on rusticat..
A Shaker Sewing Stand with Drawer; A recent find of what had been thought a form with one unique example. Made in the same shop and probably by the same hand as the other well-known stand, which descended in th..
Large Shaker Woodbox; A finely crafted example of unusually large size having a bull-nosed lift lid, a compartmented interior and a finely dovetailed case. . 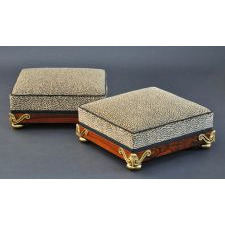 Such a grand sized woodbox was probably..
Fine Shaker Rocking Armchair; A particularly fine example of a Shaker classic. 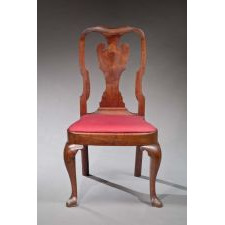 Having distinctively turned finials and elegantly carved arms this fairly large chair retains an old or original st.. 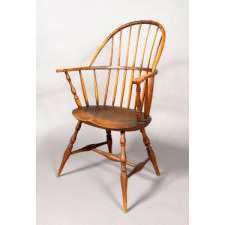 Transitional Queen Anne Armchair; New England, probably Eastern Connecticut or a Massachusetts. Ca. 1750-1770.Maple.Fine condition, minor repair at left arm joint. Retains original red wash. 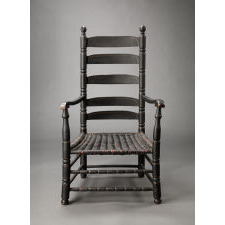 This rare form of ..
Child's Size Comb-back Windsor Armchair; Probably Philadelphia, ca. 1785 - 1800Mixed woods: poplar, hickory and ash.Fine condition, minor repairs to where the turned stile meets the crest.A rare form for a child's ch..
Six Board Chest; A six board chest with applied top and base moldings. Initialed "CVD" and with exceptional free-hand decoration. No 'touch-up!' 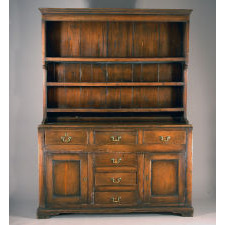 Bought privately in southern ..
Country Queen Anne Blanket Chest; A very unusual country Queen Anne one drawer blanket chest with applied banded molding on the front of the case and around the edge of the drawer, circular carvings around the..
18th Century Bowback Windsor Armchair; Fine late 18th century windsor bowback armchair, probably Boston. 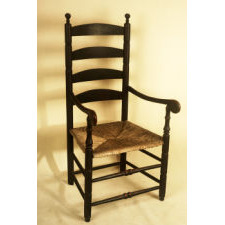 The chair is in excellent conditiion retaining an old crusty finish. It does have a small age crack in o.. Painted Pie Safe; A red painted pie safe with pierced tin panel doors. Dovetailed construction. It is in very good overall condition with a repair to 1 back foot. 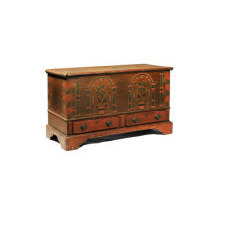 Charles Rohlfs Blanket Chest; Charles Rohlfs blanket chest. 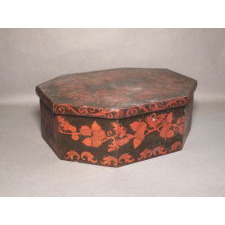 Produced from Chestnut and still retains it original surface and color. Note the deep green of the interior. The hardware is hammered copper. 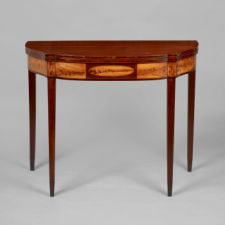 Thi..
Sewing Table; Bearing the stenciled label of Spooner and Trask, Washington Street, Boston featuring beautifully fitted drawers, the best mahogany veneers and mahogany secondary wood, origin.. 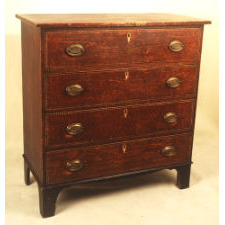 Chest of Drawers; A nicely figured curly maple bureau with original brass drawer pulls. Sheraton Side Table; Outstanding birch Sheraton two-drawer table in its original finish with cookie corners and delicate reeded legs ending in tall slim spikes. 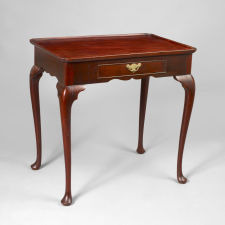 It is accompanied by th..
Card Table; Mahogany Card Table Rhode Island, circa 1785 Constructed of choice mahogany, this table features chip carving around the edge of the top, stop-fluted tapering legs, and the ra.. 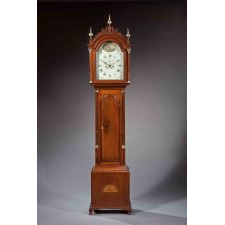 Clock; A fine mahogany shelf clock retaining its original pierced fret and brass finial. Eight day brass movement in excellent running condition and a superb enameled dial beautifull.. Barometer; A rare Boston barometer. Walnut, engraved silvered brass dial. Fine original condition. 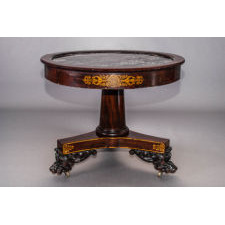 Tilt-top Candlestand; A rare and imaginative cherry candlestand with an elaborately shaped top and unusual carved baluster in olf finish and excellent condition. Federal Cardtable; Probably Boston or Salem, Massachusetts, ca. 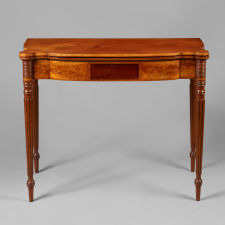 1795-1810.Mahogany, crotch flame-birch veneer, rosewood banding, pine, secondary.Condition: Vestiges of earlier varnish finishes, ..
Davenport Desk; English, ca. 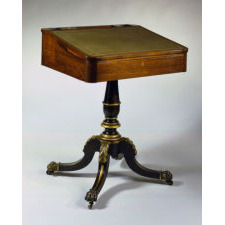 1820-1830.Figured mahogany, leather embossed writing surface.Condition: Excellent condition, some wear to leather writing surface.These fully developed mechanical..
Rare Georgian Serpentine-Front Serving Table; English, ca. 1770-1785. This period was also referred to as the Adams period. 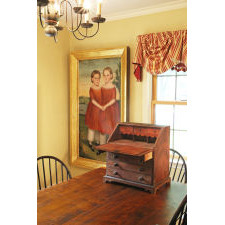 The table is possibly attributed to Robert Adams based on the family history.Figured mahogany, ma..
Sewing Box; Painted schoolgirl sewing box, detailed Acorn and folaige decoration. Untouched original condition. Possibly Phili/Balt. 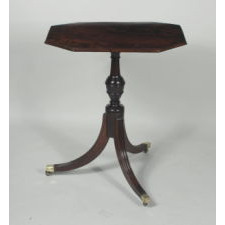 Candlestand; Federal tilt top candlestand, wonderful form, urn shaped suppport, snake feet. original red paint. Excellent condition. Gray-Green Fanback Windsor Armchair; Wondeful form in untouched structural condition with a pleasing old green over lighter green surface. 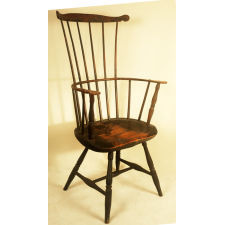 Early Ladderback Armchair With Lollipop Hands; 4-tier ladderback in excellent structural condition. Old black surface over blue over the original red. Ex. Sam Forsythe. 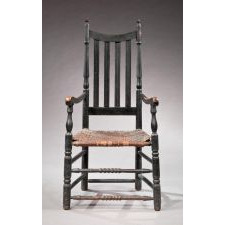 Pictured in his "Early American Homes" collection art..
Shaker Ladder-back Side Chair w/Tilters. ; A classical example, having three graduated slats and the distinctive finials indicating an origin at the Shaker community at Canterbury, New Hampshire. 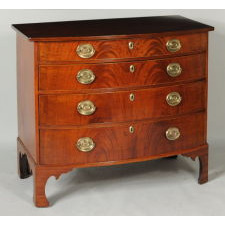 The bottoms of the rea..
Rare and Unique Chippendale Five Drawer Chest; Probably Connecticut, ca. 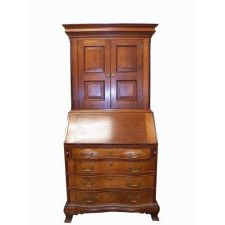 1780-1795.Cherry, tulip poplar, secondary woodCondition: One minor "cabinet-makers" mistake, refinished, retains the original oval brass.One of the m..
Walnut Queen Anne Dressing Table; A well conceived dressing table with nicely molded top with four notched corners. The drawer formation is one drawer over two. 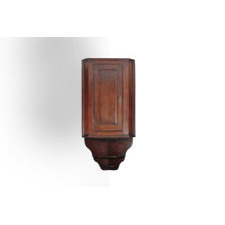 Scalloped aprons add elegant form associated wit..
Rare Walnut Hanging Cupboard; An elegant expression of clean lines and beautiful walnut. This cupboard has a raised panel door and a scalloped tail below with 2 shelves. It had butterfly hinges origi..
Rare & Vibrant Painted Blanket Chest; A rare and bright blanket chest in brilliant reds contrasted with blacks. The decoration is nicely painted with urns and flowers flanked by pillars and hearts on the cor..
Fine Walnut Queen Anne Side Chair; Nicelt designed with cupids bow crest and carved voluted ears on the ends. There is a solid splat with a pierced cone and upside down heart below it. 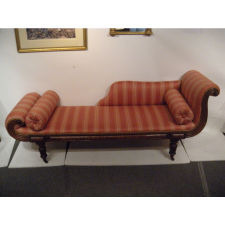 A trapazoidal slip seat r.. 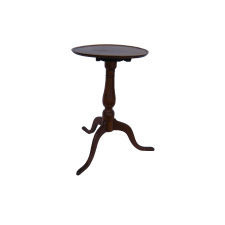 Bold Chippendale Mahogany Tea Table; An highly desirable form with nicely grained dish top, a birdcage, suppressed ball pedestal and cabriole legs terminating in claw-and-ball feet. This tea table is well p.. Paint, Pattern & People: Furniture of Southeastern Pennsylvania, 1725-1850; Through this Winterthur publication, Lisa Minardi and Wendy Cooper bring to light and unite a treasure trove of Pennsylvania-German influenced furniture. 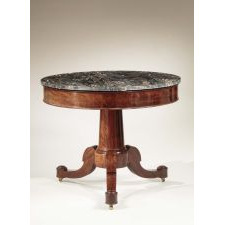 Focusing on form, orn..
Master Craftsmen of Newport: The Townsends and the Goddards; Michael Moses authored this book on the famous Townsend and Goddard furniture makers of Newport, Rhode Island, and published on the subject with the help of the famed purveyor..
William IV rosewood and burl ash center table; Superb William IV rosewood and burl ash center hall table with parcel gilt gadrooned edge on top and bottom of the apron resting on a tapered columnar (gun barrel) shaft accen..
Red leather top games table; Rare and wonderful English (or Irish) round (tip top) games table with the original red Moroccan leather top (note the diamond cross hatch marks from the tanning process) with..
Baroque Side Chair; A Portuguese- Brazilian Colonial side chair with beautifully pierce-carved crest, skirt & knees on bold ball & claw feet.Retains the original seat frame (with through ..
Stepback Cupboard; Large step back cupboard with graduated display above the three drawers and doors below. The upper display has reverse waterfall shaping. Circa 1820. The doors and ends are pa.. 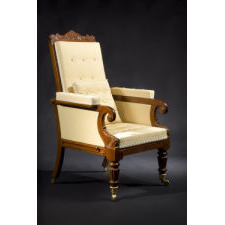 Unique Windsor Armchair; Unique shaped crest, knuckle hand-holds with carved star. Descended in the Pearson family, Byfield, MA. Undisturbed painted surface. Pennsylvania Cherry Two Piece Corner Cupboard; Cherry Two Piece Corner Cupbopard Pennsylvania Cherry Two piece Corner Cupboard Upper section with stepped Crown molding and molded mullion 12 light door opening..
Sheraton Massachusetts Mahogny Card Table; Sheraton Massachusetts Mahogany Card Table Massachusetts North Shore Mahogany and Bird's Eye Maple veneer Card Table. 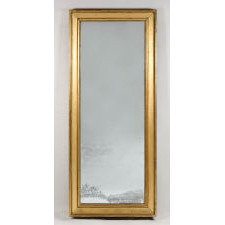 Shaped Flap with out-turned corners with sa..
Boston Neo-classical �Composition Work� Mirror; Wonderful Boston Neo-classical “composition work” mirror. 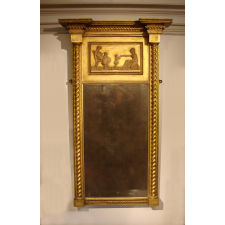 Possibly by John Doggett.This mirror has the identical scene as the one in “American Furnitur..
French Clock Cupboard or Vaisselier a' horloge; An amazing French clock cupboard or vaisselier a' horloge. Dated 1883 from the Finistere Brittany region of France. 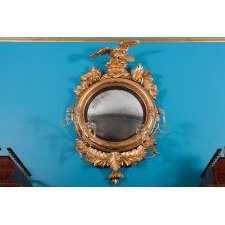 This wonderful piece is made of chestnut and highly decorat..
Girandole Mirror of St. George and the Dragon; Superb Regency carved and gilded girandole mirror of St. George and the Dragon.The carved crest is a knight astride a rearing horse on a rocky plinth. 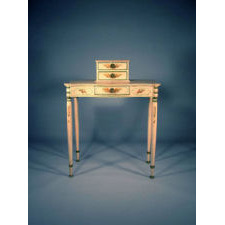 The horse (especia..
North Shore (Salem) Painted Dressing Table; Wonderful and rare North Shore (Salem) painted dressing table with unusual drawer arrangement. Superb legs with full height. 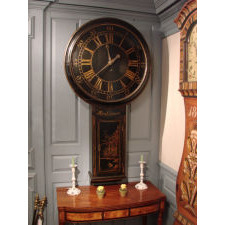 This table is of the best ..
Japanned Act of Parliament Clock; Wonderful japanned Act of Parliament clock signed by John Monkhouse in excellent condition.John Monkhouse is recorded as working in London between the dates of 1756 to 1771.Ac.. 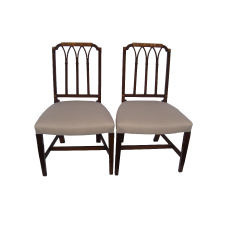 Pair of Baltimore Fancy Chairs; PAIR OF BALTIMORE FANCY CHAIRS THESE TWO KLISMOS STYLE CHAIRS WITH TABLET TOPS HAVE CANED SEATS . 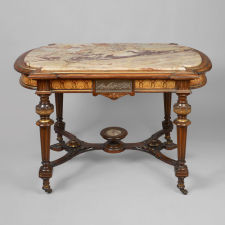 THE ORIGINAL PAINT AND STENCIL DECORATIONS INCLUDE A BUILDING AND MOR..
Federal Serpentine Card table; A SUPERB SERPENTINE CARD TABLE WITH ROUNDED CORNERS SUPPORTED BY TURNED AND REEDED LEGS. THE SKIRT IS COMPRISED OF THREE RECTANGULAR PANELS, THE CENTRAL PANEL WITH FLAME.. 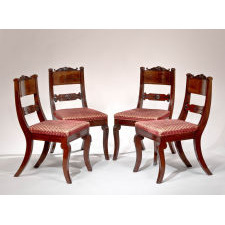 PAIR OF BOSTON SIDE CHAIRS; PAIR OF ELEGANT INLAID BOSTON FEDERAL PERIOD SIDE CHAIRS A BEAUTIFULLY PROPORTIONED PAIR OF CHAIRS WITH FINE REEDING, CARVING AND INLAYS. COMFORTABLE FOR SEATING. 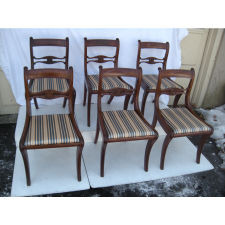 ..
Set of Six Tiger Maple Chairs; SIX TIGER MAPLE CHAIRS EACH OF THE CHAIRS IN THIS SET OF SIX HAS A WELL CARVED HORIZONTAL SPLAT, A GROWLING TIGER MAPLE CROWN RAIL AND GRACEFUL SABER LEGS. 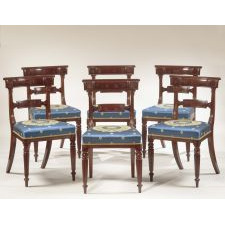 Circa 1825, New Yor..
Set Of Six Classical Klismo Chairs; THE FINEST SET OF SIX CLASSICAL CARVED SIDE CHAIRS WITH STRONGLY FIGURED CRESTS AND FINELY CARVED HORIZONTAL SPLATS. FOR SIMILAR CHAIRS, SEE SOTHEBY�S SALE OF JAN 24-25, ..
Newport Dishtop Candlestand; NEWPORT DISHTOP CANDLESTAND VERY FINE CANDLESTAND WITH HEAVILY FIGURED MAHOGANY DISHTOP Circa: 1770, Newport, RI Wood: Mahogany Conditi..
Four Drawer Chest; FOUR DRAWER CHEST THIS IS A BEAUTIFULLY PROPORTIONED FEDERAL BOW FRONT FOUR DRAWER CHEST. 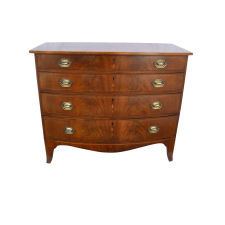 THE GRADUATED DRAWERS HAVE FINELY FIGURED VENEER PANELS ON THE FRONTS AND BELL ..
Inlaid Serpentine Card Table; SUPERBLY FIGURED BEAUTIFUL MAHOGANY CARD TABLE WITH SATINWOOD VENEER PANELS AND DOUBLY TAPERED LEGS. 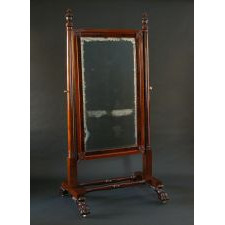 Circa: 1800-1810, Boston, Mass..
MAHOGANY AMERICAN CANTERBURY; FINE MANOGANY AMERICAN CANTERBURY Circa 1810, Boston, Massachusetts. Secondary Wood: Mahogany, White Pine and Mahogany Drawer Sides Condition: Old..
Boston Mahogany Recamier; MAHOGANY RECAMIER: SUPERB GRACEFUL FORM. ORIGINAL SURFACE WITH CARVED LOZENGES ON FRONT RAIL SURROUNDED BY BORDER OF CARVED EGG AND DART EDGING. 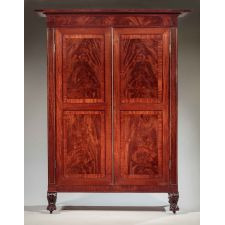 WOODS: MAHOGANY WITH WHITE.. 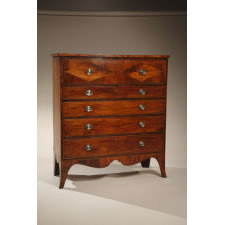 Fancy Paint Decorated 4-Drawer Chest; Dovetailed pine case and drawers with perfect proportions and a high cut-out bracket base. Original brasses and vinegar grained paint to simulate mahogany. 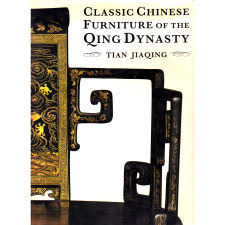 See Priddy's "Ameri..
Classic Chinese Furniture of the Qing Dynasty; Tian Jiaqing. 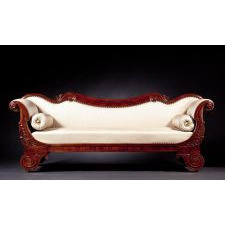 CLASSIC CHINESE FURNITURE OF THE QING DYNASTY. Hong Kong: Philip Wilson Publishers and Joint Publishing (Hong Kong) Company Limited, 1995. 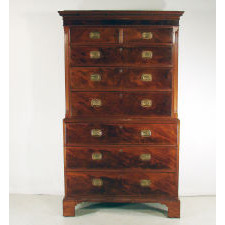 This is the 1996 Engli..
Mahogany Bow Front Chest of Drawers; Mahogany bow front chest of graduated drawers standing on turned feet. Beautifully figured wood throughout. The oval brasses are replacements. 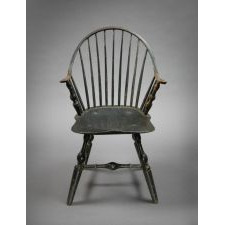 The bow is 18 inches deep at the..
Chippendale Decorated Child's Size Chair; English or American, ca. 1770-1790. 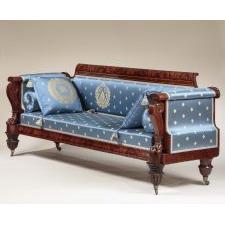 Mahogany, decorated with inlaid shells, glass, and turquoise beads, gilt highlight. 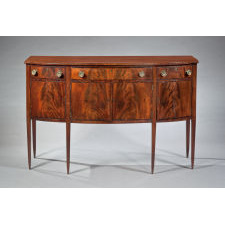 Condition: In a fine state of preservation, wonderful e..
Federal Sideboard; New York, ca. 1805-1815. 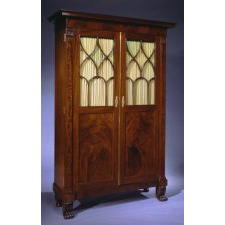 Probably attributed to the cabinet shop of Duncan Phyfe Mahogany, mahogany veneer; poplar and white pine secondary wood Fine condition, replaced brass.. 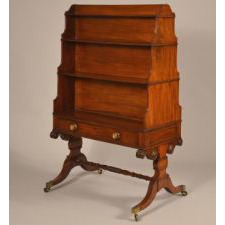 Double Sided Free Standing Book Stand; Superb Regency mahogany double sided freestanding book stand. Each side has four graduated open shelves above one frieze drawer, all with the original pulls. The sides are scr.. 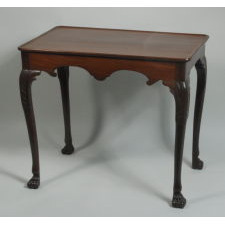 Superb Boston Classical Card Table; Excellent Boston Classical mahogany card table. 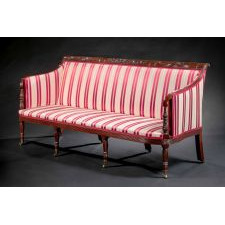 In workman's papers of the time this type of furniture was called "Greek". 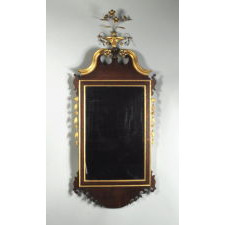 It has a fold over swivel top, incurvate frieze on a..
Chippendale Secretary; Colchester, Connecticut, ca. 1770-1785. 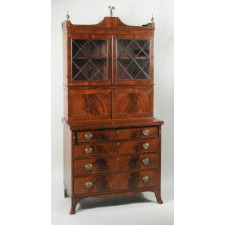 Cherry, eastern white pine secondary In a desirable diminutive size, this two part secretary has a wonderful carved broken arch pedimen.. 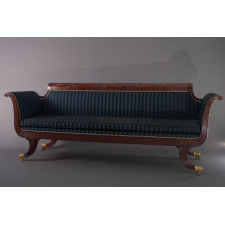 Important Philadelphia Federal Period Mahogany Breakfront; Period American breakfronts are rarely encountered. Certainly only the wealthy could afford and have the necessary room for one. This example has outstanding beautifully figur.. 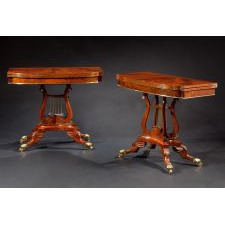 Outstanding Exact Pair of Federal Period Mahogany and Bird's-eye Maple Inlaid Card Tables Portsmouth NH Citca 1810; This is an exact pair, not an assembled one, as the card tables are perfectly matched in all details and were made together as a pair. 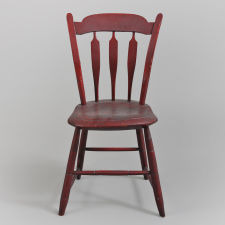 Their distinctive shapes and provenance ..
A Shaker #1 Armchair; The second smallest production chair offered by the Mount Lebanon, New York Shakers. 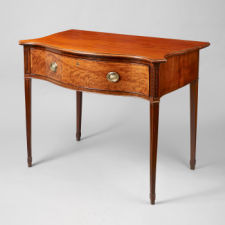 This example is a very early variant with thin graceful arms which are set off by large tu..
Chippendale Four Drawer Chest; Hartford County, Connecticut, ca. 1770. 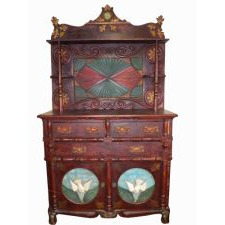 Cherry, pine and poplar secondary woods The chest has an undermolded top above four graduated reverse-serpentine drawer fronts flanked ..
Childs Size Blanket Chest; Two color ground having central potted tulip flanked by two panels of colorful polychrome compass flowers and tulips. 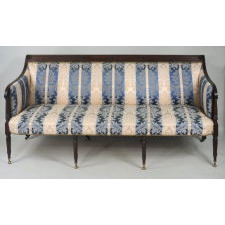 Arched checkered borders supported by baluster pillars an..
Miniature Pa Painted Settee; Rare blue ground oxidized to a greenish color. Floral decoration in yellow, red and green on double crest and back splats. 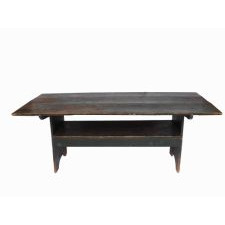 Front gold accents on legs and rails- black filigree..
Black Walnut Nakashima Double Sliding Door Cabinet; This example of a studio piece by George Nakashima is rectangular in form with dual sliding pandanus cloth doors. The right interior bears four drawers, while the left side h..
Chippendale Mahogany Wing Chair; Very fine chippendale carved mahogany wing or easy chair, with arched serpentine crest and shaped wings above rolled out conical arms, with serpentine front seat rail and cush..
Boston Area Side Chairs; A very good pair of maple and birch Spanish foot side chairs with excellent turnings and overall form, Boston area, circa 1740,50. These chairs have recently been up..